The popular FOX News star of Tucker Carlson Tonight offers his signature fearless and funny political commentary on how America’s ruling class has failed everyday Americans. “You look on in horror, helpless and desperate. You have nowhere to go. In Ship of Fools: How a Selfish Ruling Class is Bringing America to the Brink of Revolution, Tucker Carlson tells the truth about the new American elites, a group whose power and wealth has grown beyond imagination even as the rest of the country has withered. The people who run America now barely interact with it. They fly on their own planes, ski on their own mountains, watch sporting events far from the stands in sky boxes. They have total contempt for you. 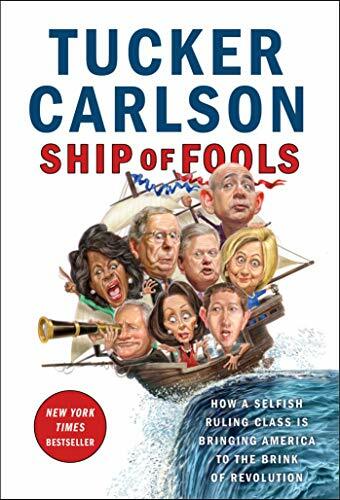 Our leaders are fools, Carlson concludes, “unaware that they are captains of a sinking ship.” But in the signature and witty style that viewers of Tucker Carlson Tonight have come to enjoy, his book answers the all-important question: How do we put the country back on course?